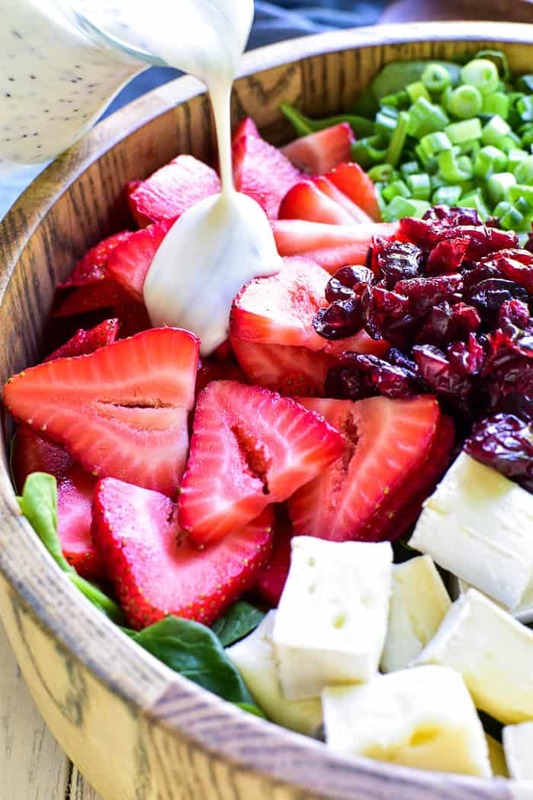 This Strawberry Brie Spinach Salad is one of our favorites! Made with fresh spinach, sliced strawberries, dried cranberries, pecans, and brie cheese, this strawberry salad is the perfect combination of savory, sweet, creamy, and delicious. It makes a great lunchtime salad and can be topped with chicken or shrimp for a more satisfying dinner. And….it’s equally delicious as a fresh, unique side dish for any meal. Whether you’re a strawberry salad connoisseur or trying it for the first time, you’ll love everything about this creamy strawberry brie twist! Can we talk for a minute about my obsession with strawberry salads? Because it’s serious. And…it’s growing. Between this Summer Strawberry Salad and this Strawberry Bacon Blue Cheese Salad and this Strawberry Cucumber Salad, I think it’s safe to say I’ve never met a strawberry salad I didn’t like. But. There’s something about this Strawberry Brie Spinach Salad that I absolutely LOVE. For one, you can’t beat the flavor combination. Strawberries + pecans + dried cranberries + brie? Tossed in a creamy poppy seed dressing? To die for. 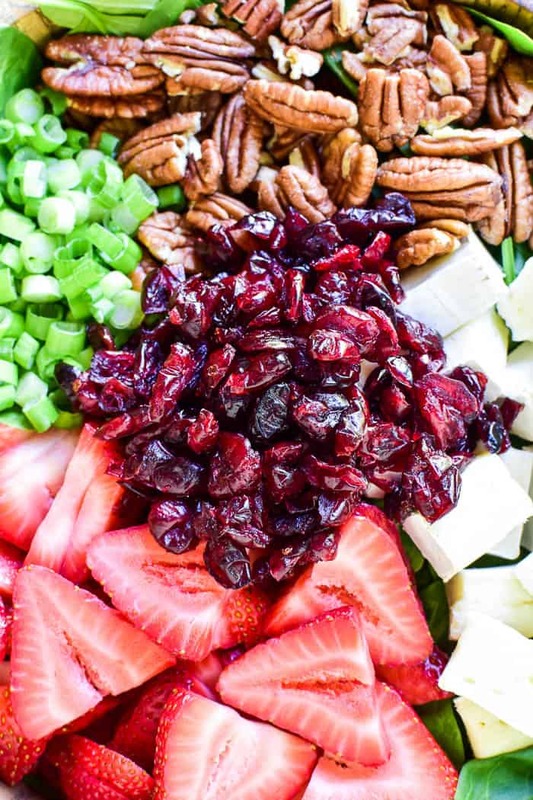 And I love the fact that the cranberries and pecans help take this salad from summer right into fall. But what I might love most of all about this salad, aside from how delicious it is, is how completely GORGEOUS it is. I’m totally in love with the colors…for summer, for fall, or for anytime. HOW DO YOU MAKE STRAWBERRY BRIE SPINACH SALAD? Pour 8 c. fresh spinach into a large salad bowl. Arrange 1 1/2 c. sliced strawberries, 4 oz. brie cheese, 1/2 c. pecan halves, 1/3 c. dried cranberries, and 1/4 c. sliced green onions on top. Prepare poppy seed dressing and drizzle on salad as desired. HOW DO YOU MAKE CREAMY POPPY SEED DRESSING? In a small mixing bowl, combine 1/2 c. plain Greek yogurt, 1/4 c. mayo, 3 Tbsp. lemon juice, 3 Tbsp. honey, and 2 tsp. poppy seeds. Drizzle over salad; store leftovers in an airtight container in the refrigerator. WHAT SALAD DRESSINGS GO WITH STRAWBERRY SPINACH SALAD? 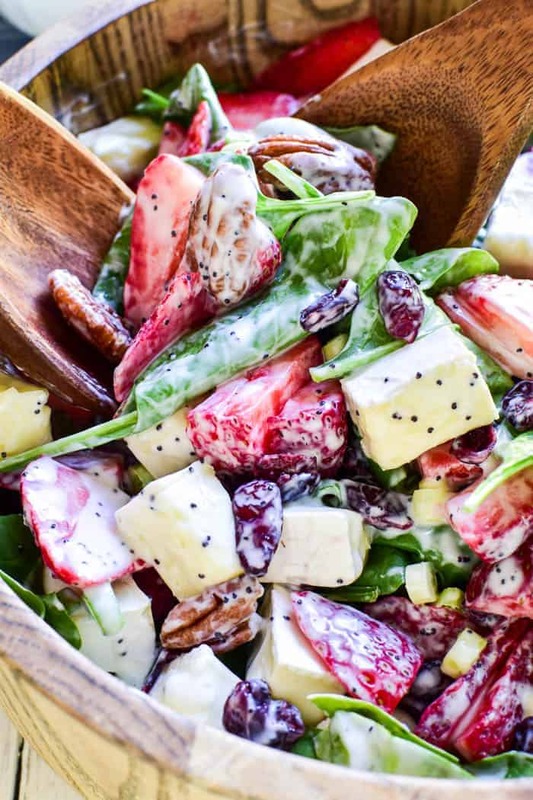 In addition to the Creamy Poppy Seed Dressing recommended in this recipe, Strawberry Spinach Salad goes well with Balsamic Vinaigrette, Poppy Seed Vinaigrette, or Honey Mustard Salad Dressing. WHAT TYPE OF CHEESE GOES WITH STRAWBERRY SPINACH SALAD? 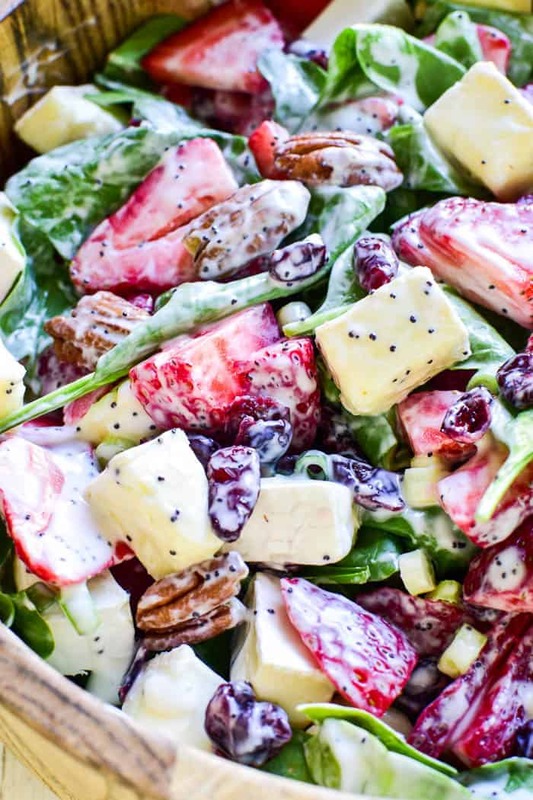 I LOVE this salad with brie cheese, but if you’re not a huge fan of brie you could also consider using feta, goat cheese, blue cheese, or even shaved parmesan. This Strawberry Brie Spinach Salad is one of our favorites! 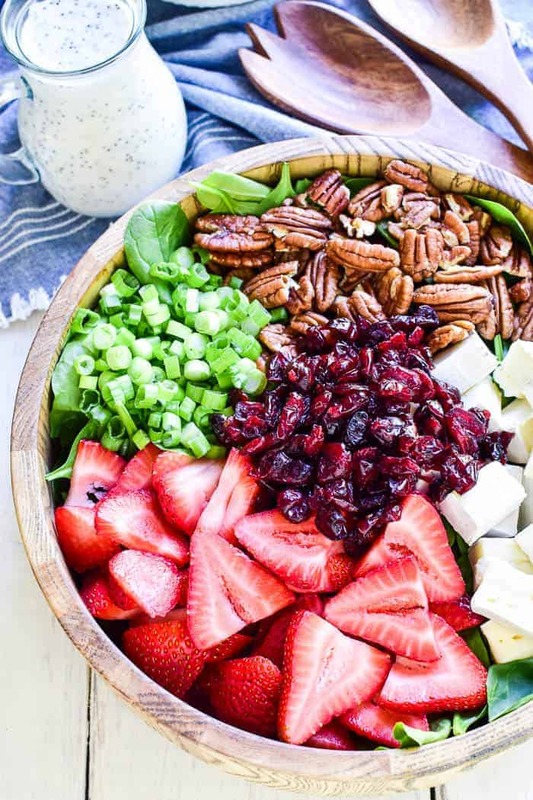 Made with fresh spinach, sliced strawberries, dried cranberries, pecans, and brie cheese, this salad is the perfect combination of savory, sweet, creamy, and delicious. It makes a great lunchtime salad and can be topped with chicken or shrimp for a more satisfying dinner. And....it's equally delicious as a fresh, unique side dish for any meal. I am not normally one for salads but this one I would eat every single day! I can see why this is a favorite! Love that combination of savory and sweet! What a beautiful salad! I absolutely love the Brie, and I’m really loving the creamy dressing! This salad looks amazing! It’s all of my favorites together! This looks absolutely terrific, love the inclusion of brie! Could walnut halves be used in place of the pecans?? This salad looks so good! I have to make it for lunch this week!